The main goal is always to beat my PR over the distance. And the other is to come in under a predetermined time–an ambitious, just-out-of-reach time that is inspirational more than realistic. 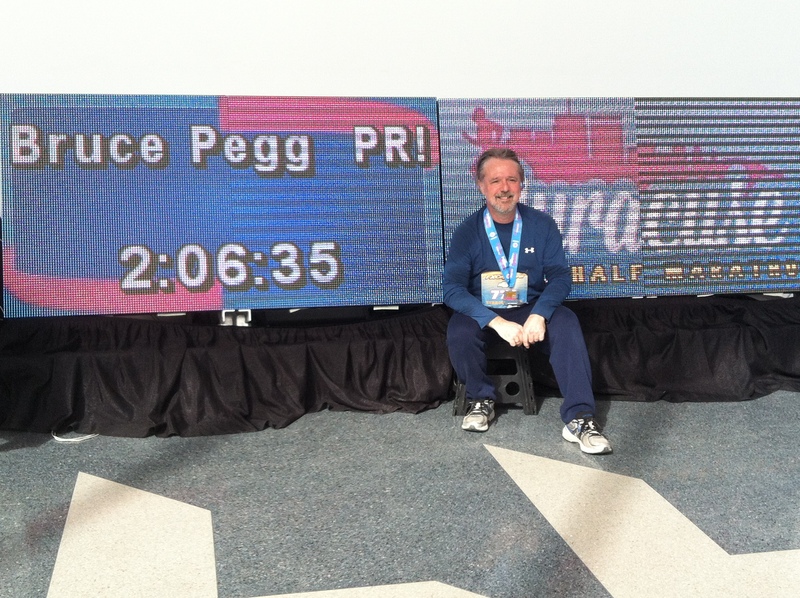 On the morning of the inaugural Syracuse Half Marathon, neither goal seemed even remotely realistic. As mentioned in the previous blog, I had been fighting Hanson’s-induced exhaustion. I was also trying hard to walk the tightrope between preparing for the race (i.e. tapering) and staying on the program (i.e. not tapering). In the end, I modified the training program for the week and opted to forgo the strength and tempo workouts and reduce the weekly mileage from 49 to 41. Even so, the 5-mile run I had planned the day before the race was just plain awful–slow, and ponderous–and I spent the rest of the day headachy and groggy. Add to that the freezing temperatures at gun time, and the recipe for disaster had been well and truly mixed. Yeah, it was THAT cold! Inaugural Syracuse 1/2 Marathon, March 24, 2013. I should have known better, though. If my years in the entertainment business have taught me anything, it is that the worse the build-up for a show, the better it turns out. So when the gun went off, and we headed down State Street, I got the feeling that maybe this was going to be a good run. I had studied the course map before the race, and knew that the first couple of miles was going to be up the James Street hill into Eastwood, so I made the decision to ease my way into the race. Like most racers, I also wanted to enjoy running on the streets I had only ever driven on–definitely a unique experience. As we made the turn into Shotwell Park, a few brave spectators began to materialize, and spurred on by their support and a general feeling that my mojo was back, I moved into second gear and found a pace I was able to sustain throughout the remaining 10 miles. For a while, I ran alongside a guy I immediately nicknamed Flatfoot Frankie, who scraped the pavement so badly with every foot strike that I wondered if he was going to need a second pair of sneakers to finish the race. Then, a little further along where the course moved off Route 298 and into the Lyncourt neighborhood, I passed a sweet lady who looked to be in her 70s and who was just cruising along in her own zone. I couldn’t help but be inspired. The route finally led us down a gentle slope to the Inner Harbor and eventually onto the Creekwalk. I had been curious about this area for some time and thoroughly enjoyed running through this little urban oasis before heading into the Armory, the spiritual heart of the Syracuse downtown. After that, a little 2-mile detour around the south side, and we were back at the OnCenter, where I was greeted at the finish line by my daughters brandishing a sign saying “Go, Team Love Nugget!” That, and the realization I had come in 4 minutes under my PR brought a broad grin to my face. The race, as I think the organizers intended, was a good tune up and reality check to gauge training progress for those of us targeting spring marathons (and here, my heart goes out to those who, just a few weeks later, made the trip to Boston only to witness the senseless violence that ended the race). My only criticism (not that I think the race organizers can do much about it at this point in the race’s history) was that the course was not well policed, and that at various points runners were in danger of being injured by reckless motorists. Within minutes of the start, for example, a driver tried to turn into an apartment parking lot through a crowd of runners without waiting for an appropriate moment to do so. And later, up in Lynwood, a distracted driver almost hit a runner after missing a policeman’s signal to stop. But despite that and my own difficulties, the race has a lot going for it. Whether I do it again or not very much depends on what happens over the remainder of this year. Oh, and a big shout out to my friend Laura McGrath, who baked an amazing cake/pie thing in celebration of my finish. Not only was it delicious, but it also replaced far more calories than I burned off while running the race! Proof of the PB! 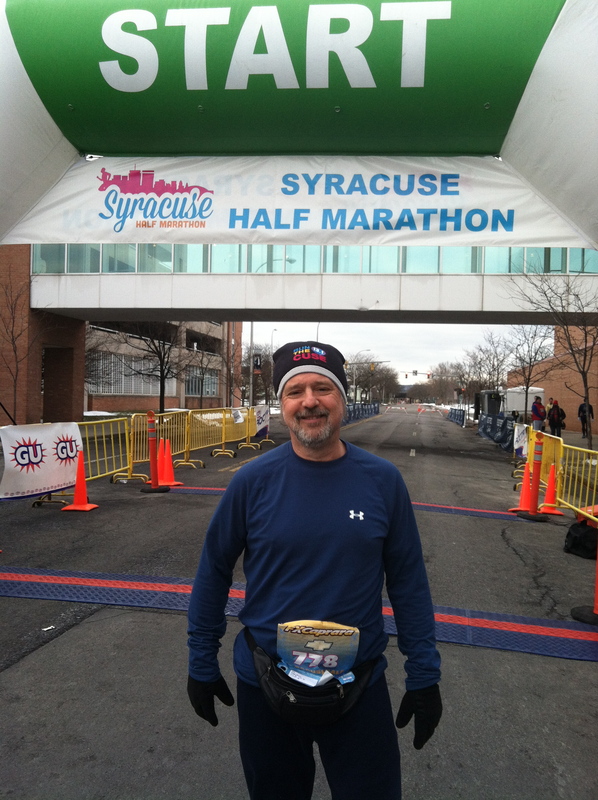 Inaugural Syracuse 1/2 Marathon, March 24, 2013. This entry was posted in The Flat-Footed Fox and tagged Hanson's Marathon Training, Syracuse 1/2 marathon. Bookmark the permalink.